These articles refer to the state of the world at the start of the grand-campaign (1444-11-11). The regional divisions of the East Indies super-region. East Indies super-region is stretched from the southeastern part of Asia and across the islands up to Oceania. The super-region can be divided into smaller zones of conflict: the mainland section to the north, the main islands in the center and the archipelago islands to the east. The mainland is situated between two other super-regions, one of which is the home of Ming, an existing great power flying the banner of the Emperor of China. The other super-region tends to raise a strong contender towards the mid-to-late game laying a claim to the Indian sub-continent. For the most part the nations on the mainland remain safe from outside threats due Ming being contend with local forces becoming tributaries or the long time Indian powers require to get a hold of their own regions. 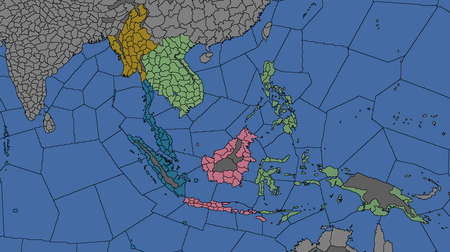 The situation allows for the nations of Dai Viet, Ayutthaya, and Lan Xang to exercise the advantage gained from their tributary status over their non-tributary neighbors in future wars of conquest. In Burma, the situation is markedly different. Instead of paying tribute to Ming, the collection of Shan principalities and Burmese city-states residing there instead choose to place themselves under the protection of the Ava Kingdom, who controls most of the Burmese heartland. However, Ava has been steadily declining in recent years, and wars within their sphere of influence are common with states such as Taungu vying to once and for all unite the region under one flag. The main islands, being somewhat distant from Ming and India, becomes a race for the formation of Malaya – with the first phase of it involving being the elimination of any existing competition within their local islands. The strongest of the Malayan claimants usually end up as being: the trade dominating Malacca, competing with Pasai in Sumatra, Brunei in Borneo, and Majapahit in Java. The archipelago islands have always been distant enough to preserve their autonomy even in the face of seemingly stronger neighbors. Although the archipelago has developed into a microcosm of co-existing religions and cultures, the small nation states eventually tend to rival each other due to lack of other options. As time progresses, the power consolidation becomes evident and the once gentle microcosm ends as a power struggle between two medium-sized nations (big powers by local standards). A potential point of contentious may derive from the local Muslim nations aggressively propagating their religion to provinces of other nations through trade. If not properly contained, this can cause a religious instability within one's country forcing them to convert or risk zealot uprisings. Due to their surroundings, and them being the last stop on the way to the east, the islands would be the first to learn of the European risk. Towards the mid-game the first European powers start to arrive at the area and target the colonizable provinces – and consequently the nearby island nations that may inhabit them. By the end-game large parts of the islands may find themselves under European rule as they push their way to China and the Far East regions. Some would say that the divided nature of these rich areas makes them vulnerable. Only time will tell if they can survive the arrival of new faiths, peoples and weapons. Monarchy is the dominant government form in these parts (appearing mainly as Mandala System with Plutocracies appearing more often in the east and south). A single Republic government is located on the most eastern part. Theravada and Mahayana in the northern part. Animist and Hindu in the eastern and southeastern parts. Sunni in the central and southwestern parts. All nations in these parts belong to the Chinese technology group. Burman in the northwestern part. Mon Khmer and Thai in the northern part. Malay in the central, southern and eastern parts. Small pockets of Pacific in the most eastern part. These nations do not exist at the start of the 1444 grand-campaign. They may still appear due to revolts by Separatist rebels (or special events). In (parentheses) are the dates they first appear in. Notes: This region holds provinces necessary for forming Shan. For Dai Viet, Annam and Tonkin. For Muslim countries in the Malay culture group. Notes: This region holds provinces necessary for forming Malaya. For Pangasinan, Tondo and Maynila. For Makassar, Buton and Luwu. This page was last edited on 13 December 2018, at 11:09.